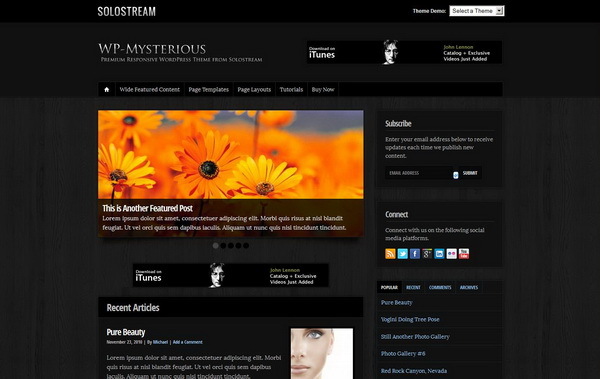 WP Mysterious theme is a dark colored premium WordPress theme which has a professional design. The theme is best suited for personal blogs, business sites and online magazine. It has a mobile ready responsive layout making the theme acceptable to all size browsers. The theme has been developed and released by Solostream Global Media. Logo integration is quite easy and quick in the theme. Author page in built with theme has been provided. Template for Portfolio page, You Tube Video Page and all authors page template are included in theme. Responsive and latest modified design framework is provided to theme. Theme setting page for easy customization has been added to theme. Multiple home page, post layout options have been added in theme. Two featured narrow and wide Articles Sliders have been included in theme. Widget for Subscription form is provided. Slider for featured pages is included in theme. Alternate home page template for business sites is provided in site. Featured widgets for category posts, footer widget and social networking icon widget have been added to theme. Post thumbnails which are automatic are in built with theme. Ad locations of multiple banners are provided in theme. The theme is compatible to all browser sizes including iPods and I phone. Font and color can be changed easily. Theme can be modified and used with several sites for ever without paying extra charges. Theme is compatible with latest version of WordPress 3.4+. Theme is almost compatible with all WordPress Plug-in. Theme is Search Engine Optimized. Paid customization services for support are available. It is very easy to add own logo to theme. No problem has been observed with theme. Club membership is offered for basic, silver and gold status in $79, $99 and $129 respectively providing all facilities of downloading, upgrading, support and renewal. Theme is also available to users in $ 59 which includes life time support and up gradation. Website also offers a discount of $10 on discount code coupon 26009B.